Essential for all biology and biomathematics courses, this textbook provides students with a fresh perspective of quantitative techniques in biology in a field where virtually any advance in the life sciences requires a sophisticated mathematical approach. 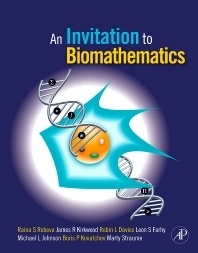 An Invitation to Biomathematics, expertly written by a team of experienced educators, offers students a solid understanding of solving biological problems with mathematical applications. This text succeeds in enabling students to truly experience advancements made in biology through mathematical models by containing computer-based hands-on laboratory projects with emphasis on model development, model validation, and model refinement. courses in mathematical biology, as well as in general mathematics and biology courses that cover the application of math and statistics to biological problems. The reader is not expected to have any extensive background in either math or biology. Sweet Briar College, Virginia, U.S.A.
University of Virginia, Center for Biomathematical Technology, U.S.A.
Great Introduction to mathematical modeling of biological scenarios!